Japanese Episode AG 140: "A Rival Confrontation! I Get a Windie!" American Episode 410: "On Cloud Arcanine"
While waiting in line at a famous bakery, Haruka spots the legendary pokemon Windie. The majestic fire pokemon immediately catches the young Coordinator's eye, so she decides that she just -has- to catch it. However, Haruka is shocked when she sees Shuu, her Contest rival from Houen, chasing after the pokemon as well! Shuu reveals that he's already received one Kanto Contest Ribbon and declares that he'll be the one who catches the wild Windie. 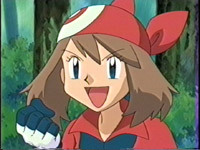 Haruka ignores her rival's taunts and chases after the pokemon on her own, but its Extremespeed technique makes it especially difficult to catch. After a number of failed capture attempts, Haruka corners the pokemon on a nearby clifftop. There, she encounters Shuu again, so the two decide to have a battle to determine who should catch the Windie. Shuu's Flygon easily defeats Haruka's Zenigame, but the victor changes his mind about catching the Windie when he sees that it has a family. As everyone watches the legendary fire pokemon feed its children, the Rocket-Dan appear and try to kidnap all the fire pokemon! Haruka and Shuu put their rivalry aside and work together to defeat the Rocket trio, rescuing the pokemon they had been trying to catch. Now that the Windie is reunited with its family, Shuu tells Haruka about the upcoming Yamabuki City Contest. Since the city's on the way to the Battle Arena, our heroes decide to stop there first so Haruka can compete in her first Kanto region Pokemon Contest. Wow, the early Battle Frontier has some really awful fillers. Yes, technically it's not a filler since it's the Kanto debut of Shuu, but I don't think that's enough to save this episode from the dreaded "filler" status that everyone loves to assign to any episode that's utter crap. I think my main problem with this episode is how unbelievably random the whole thing is. I mean, where does Haruka's sudden love for Windie come from? She never mentioned being particularly fond of the pokemon before, and, as far as I know, she's never mentioned it since. Why is this girl chasing after a pokemon that would stick out like a sore thumb in her collection of cute and elegant pokemon? Another random thing that bothered me was the Rocket-Dan's boss from the Houen League just randomly appearing in Kanto. I thought his story was finished...what is he doing running a bakery in the middle of nowhere? And why would he rehire the Rocket-Dan after the way they acted at the end of the Houen League? It's particularly frustrating when you look at how the anime will pass up all these great potential reunions but then give us this one out of nowhere. I will say this about the episode, though; I do like the fact that Musashi's Dokucale finally got some love. Musashi's moth pokemon is probably one of the most neglected pokemon in Advanced Generation (topped only by Takeshi's Foretos), so I think it's nice we got to see it battle. In fact, the last time it made an appearance was in "Rhapsody in Drew," which was almost twenty episodes ago! It's about damn time, anime writers. The dub is absolutely mediocre. It's not particularly good, and it's not particularly bad; it just is. 4Kids made the first two seconds of the episode go bye-bye. A Japanese vocal song gets replaced by instrumental music in the dub, bla bla bla. This time, the vocal song is the full version of Battle Frontier, and in the Japanese version it plays throughout Haruka's and Shuu's battle against the Rocket-Dan. Finally, a second is removed from our good friend, the TO BE CONTINUED.. screen.